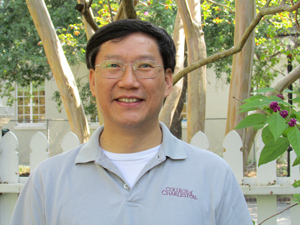 Since 1993, Professor Guoli Liu has been inspiring students at the College of Charleston to learn more about the world through political science courses on China, Russia, and world politics. Dr. Liu has taught more than 120 classes and advised countless number of majors in his 20 years of service so far. We were able to chat with him to learn about his passion for teaching and research and find out what else he enjoys. What inspired you to become a Political Science Professor? I was fortunate to have passionate and outstanding professors who taught me international politics and comparative politics at Peking University and the State University of New York at Buffalo. My teachers inspired me to become a Political Science professor. As a researcher, what issue do you find most interesting so far? I studied the state-market relations in China, Japan, and Russia. It seems that most efforts at developing state-dominated models of economic growth have failed. It is important to find a balance between government regulation and market dynamics. We still do not know what is the right balance. The on-going search is challenging and significant. What’s your next big research topic? I am exploring the relationships between globalization and inequality. I am also very interested in contending theoretical interpretations of China’s search for modernity and its changing relation with other countries. You have taken several groups of students to China through the study abroad program, which part of China do you enjoy sharing with them the most and why? Most of my students and I enjoyed our learning experience in Beijing the most. Beijing is China’s cultural and political capital with deep historic roots. It has great universities, the Forbidden City, and the Great Wall. You can feel the excitement of a city undergoing rapid and profound transition from tradition to modernity. I would like to go to Russia to find out more about how the country is doing in the post-Soviet era. Which book has had the greatest impact on your career? Robert Gilpin’s The Political Economy of International Relations (Princeton University Press, 1987) has had a profound impact on my thinking of state-market relations. The Three Kingdoms by Luo Guanzhong is fascinating book on Chinese culture, history, and strategy. What’s your favorite part of working with students? I enjoy working with students on solving academic puzzles, gaining a deeper understanding of politics, and developing their independent perspectives on key issues. What class do you enjoy teaching the most? World Politics is complex and changing all the time. In this introductory class, most students are freshmen who are curious and eager to learn. Every World Politics class is new and challenging. Work hard, don’t hesitate to challenge authority, and prepare to make some new contribution. My teaching style is interactive, flexible, and cooperative. I enjoy reading, walking, table tennis, and folk dance. If you could sit in on a C of C class, which one would it be and why? I want to take a computer class to bridge the digital gap between me and our students. What’s been your best moment as a professor at the College? The commencement at the College is always beautiful and exciting. It’s great to see students succeed in education and move forward to building a better future. I was fortunate enough to be attending the College when Dr. Liu arrived. Over the last four semesters of my undergraduate career, I had a number of courses with him, and he and Professor Mann were the most memorable and influential professors I had during that time. Dr. Liu was the most intelligent and interesting professor I had the privilege of taking during college. It was because of he and Dr. Moore (RIP,) that I made Political Science my major, while focusing primarily on Chinese Politics. Dr. Liu was a wonderful advisor, and is as an approachable/helpful of a professor as one will find at the College of Charleston. Go Cougars, Hooyah Navy!